This forklift, the smallest truck in the GEX line, is made with the same durability as its bigger models, but it’s compact dimensions and tight turning radius gives it the maneuverability to work in tight dock areas. With its 4-wheel, solid pneumatic tires, it is suited for indoor and moderate outdoor environments for the manufacturing, warehousing and shipping and receiving industries. 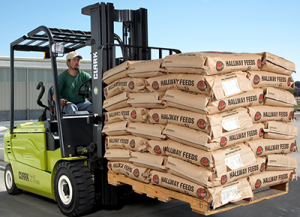 Each lift truck comes with programmable safety and performance features to fit your exact needs. 100% AC system, 36 or 48 volt. This system compares to similar internal combustion trucks in acceleration rates, speed and its ability to climb inclines. The hydraulic cushioning minimizes shock and vibration for smooth operation. The 6 rollers manage load distribution in reducing free play. Password protection prevents others from changing safety settings, such as speed limitation.